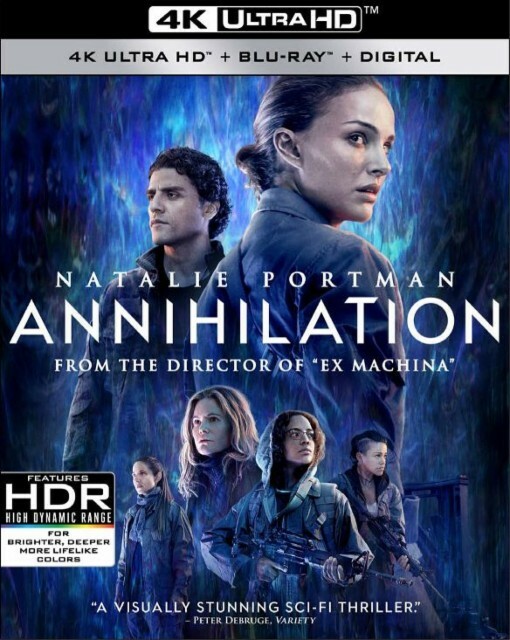 On May 29th, Paramount Pictures released Alex Garland’s ANNIHILATION on 4K Ultra HD Blu-ray. Bigfanboy.com is hosting a contest where a few lucky winners could get a copy on 4K Ultra HD Blu-ray. Just send us an e-mail and tell us what your favorite Natalie Portman performance is and why. Make it good, no one-sentence answers please. We want these to go to deserving winners. Contest is open to U.S. residents only. Make sure to include your shipping address with your e-mail. Contest ends on June 10th, 2018. One entry per household – all duplicate entries will be deleted. Get those entries in a good luck! – Refractions – See how director Alex Garland created the tone, textures and color palettes for the various film environments on set. – For Those That Follow – Listen to the cast’s perspective on their roles and learn why they found the story so intriguing. – Shimmer – See how filmmakers transformed real set locations to create the world of Annihilation. – Unfathomable Mind – Learn why the visual effects are integral to achieving director Alex Garland’s overall vision for Annihilation. – The Last Phase – Listen to the cast and crew share their fondest memories from filming Annihilation. I still recall the first time I saw her in León, The Professional. She was captivating even then. Especially the scene where she knows her family is dead and she’s begging to come into León’s apartment. Even in that early role, you could see the kind of star she would become. Which was proven when she won the Oscar for Black Swan. V for Vendetta is another of my favourites of hers – especially the fake prison sequence! Hey Sean, please make sure to send this to us in an email, as that’s the only way to enter.